Magnus Carlsen at the 2013 Chess Candidates Tournament in London, as seen in the 2016 documentary film ”Magnus,” directed by Benjamin Ree. Chessmasters are not like you or me, and the 26-year-old Norwegian wunderkind Magnus Carlsen is unlike any other chessmaster. He seems more like a fantastic literary creation sprung from the mind of Vladimir Nabokov or Jorge Luis Borges. As seen in Benjamin Ree’s brisk, suspenseful, and intimate documentary “Magnus,” the title prodigy was a withdrawn child, bullied in school. To engage his interest and raise his self-esteem, his father gave him a book with the flags, descriptions, capitals, and statistics of 428 countries. Magnus re-created the book from memory on paper, complete with flags, facts, and figures. He was 5. His father thought that, with a memory like this, plus a knack for math, Magnus would be a natural at chess. And he was. By the age of 13, which is when Ree started filming his story, he was a grandmaster and had played former world champion Garry Kasparov to a draw in a blitz chess tournament. By 2013, he was ready to take on world champion Viswanathan Anand. Anand had taken chess into the digital age, laboriously preparing for each match with the aid of computers and a team of grandmasters as coaches. Carlsen, meanwhile, was both admired and criticized for his more playful approach to the game. He didn’t need to memorize past games and potential moves; he could think on another level. He envisioned the different positions and possibilities on the board as a kind of matrix, glimpsing the best move in an instant, a process which the film re-creates, à la genius movies like “A Beautiful Mind,” with animated graphics. Thus, the tournament was the clash of calculation versus intuition, of the spirit versus the machine. “Magnus” captures the agonies that precede and follow both the joy of victory and the agony of defeat. 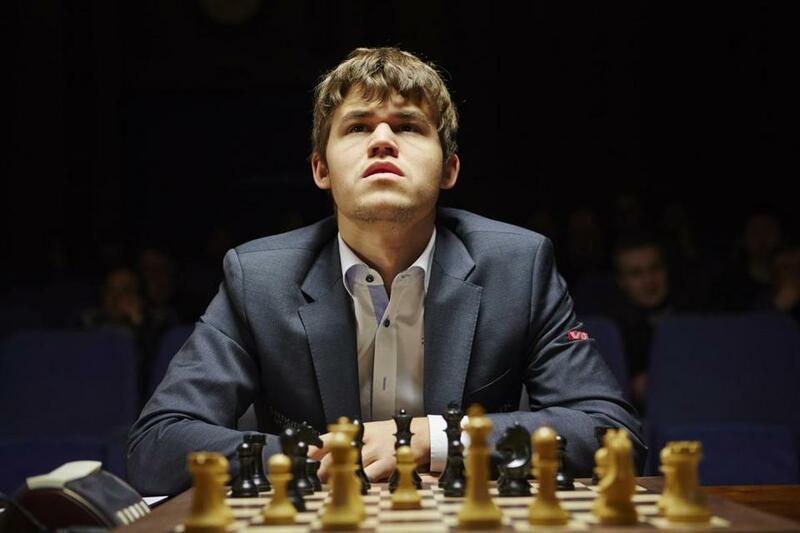 When his intuition fails in key contests, Carlsen is devastated. When he wins, he’s haunted by the countless variations of moves he could have made. Somewhere in his mind he is always playing chess, he confesses. It’s a lonely life, but an inspiring one. Though he is nicknamed the “Mozart of Chess,” in looks, presence, intensity, and absolute commitment to the game, he is more like Tom Brady. And chess as seen in this film is a game as fascinating and exciting as football. “Magnus” is now available on VOD. For more information go to filmrise.com/magnus-documents-a-genius. In the self-help business for years and gaining little traction, Ray scored a break when he appeared as one of the subjects in the 2006 documentary “The Secret.” In it, he shared his eclectic motivational philosophy, which combines familiar New-Agey themes of self-forgiveness and positive thinking with the reality show “Survivor.” In addition to pep talks, he had his followers push their bodies to the limit, including fire walking, lying on broken glass, fasting, and his version of the Native American sweat lodge. He would herd a group of acolytes into a confined tent heated by stones to 120 degrees and leave them there. Unfortunately, in 2009 in Sedona, Ariz., at one of these “Spiritual Warrior” retreats, he left them in the tent too long. He ignored cries for help and pleas to be let out. Three people died. Convicted of negligent homicide, he was sentenced to two years in prison. Carchman’s film chronicles the rise and fall of Lee and his attempts to get back into the business in 2013. It puts his career in the context of the self-help, motivational therapy, and cult phenomena, investigating the motives and methods of those who sell it and the needs of those who sometimes pay fortunes to be subjected to the will of spurious, sadistic spiritual leaders. “Enlighten Us” can be seen on Thursday at 9 p.m. and 11 p.m. and on Saturday at 8 p.m. and 10 p.m. on CNN. It will be available on VOD beginning on Friday. For more information go to www.cnn.com/shows/enlighten-us.